In the Mystery from Atlantis, players can delve into more than 40 hidden-object adventure levels with clever puzzles to solve all along the way. For the first time, players can customize their adventure. Choose a relaxed experience with a robust hint system, or a timed challenge with scoring. Repeat the fun in either mode and unlock the special hidden object mode for those times when you just want to seek and find. 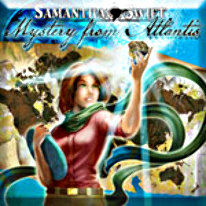 Join the adventure with Samantha Swift and the Mystery from Atlantis!